Several weeks ago I was invited to join a group of bloggers to meet the people from Dole Salads, tour a farm, visit the plant, and taste some of their new products. Dole is the largest producer of fruits and vegetables in the world, with over 15,000 growers in 90 countries around the globe. Before the event I had a neutral impression of Dole… and my strongest association was that they grow pineapples and bananas. After the event I have a very positive impression of the company, their safety practices, and their products. While ideally I’d love for all my readers to eat local, seasonal produce, I know it’s just not possible to get fresh local veggies and fruits in many cities and towns. I absolutely would buy Dole salads if I couldn’t get farmer’s market lettuce, after seeing the care with which it’s produced. For extensive coverage of the event from some of the other attendees, see the links below. Hairnets for everyone! And beard nets for the men. Who knew? All the workers wear these, and they sanitize their knives throughout the day; workers in the plant wear gowns, gloves, hairnets, and boots. I asked readers to submit questions for me to ask Dole. Here are your questions and Dole’s answers. If and when would you consider offering some of your salad mixes in non-GMO and/or organic varieties? Dole doesn’t grow any GMO crops* [Yay!]. We are considering offering organics in the future, as some of our growers are already certified organic. As you might know, it’s extremely expensive to become certified as an organic farm, and many of our growers just can’t afford it. 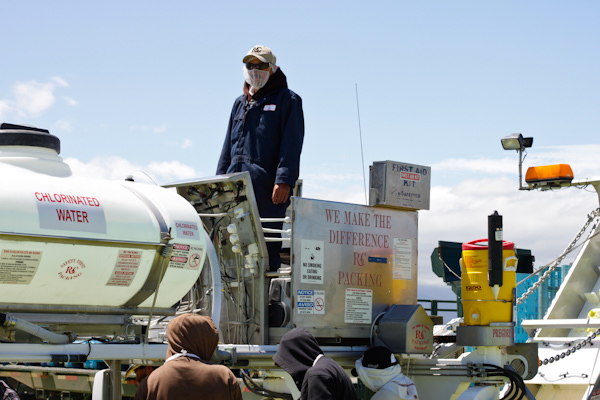 [More than 90% of Dole farms are owned independently, with the farmer responsible for everything up to harvest]. 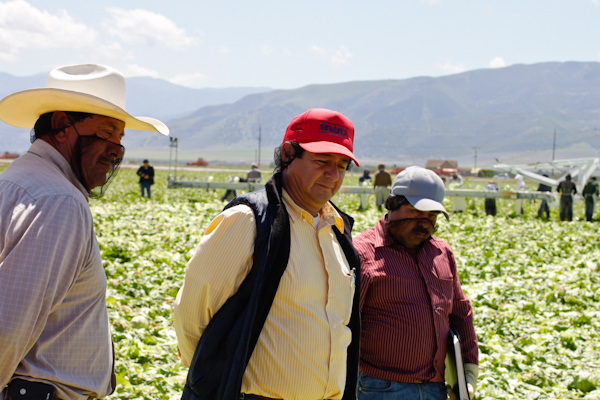 However, we work with all our growers to use the smallest possible amount of pesticides and herbicides, we test rigorously, and we use integrated pest management whenever possible. For the last full year (2010/2011), 62% of the samples analyzed had no measurable pesticide residue. * However, all of their salad kits include dressing made with genetically modified soybean oil. I did talk to them about this, and suggested they consider sourcing another oil for their dressings that’s not GMO, since they are otherwise GMO-free. Sadly, I did not win the salad quiz. 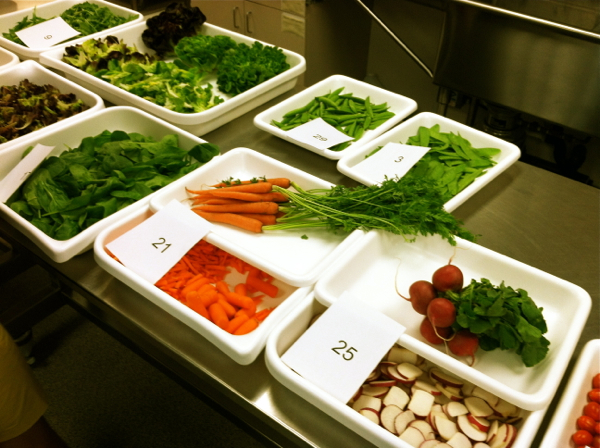 It’s difficult to identify two dozen lettuce varieties! Should people re-wash bagged salads, even if they say triple-washed? 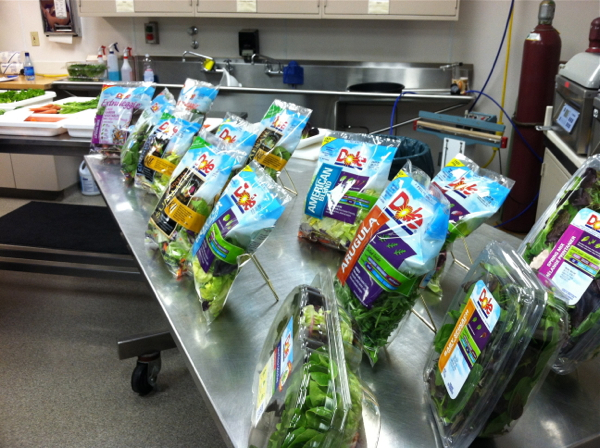 We feel confident, because of testing, that our bagged salads are absolutely safe to eat right out of the bag. The truck moves slowly along while the workers cuts each head of iceberg by hand. 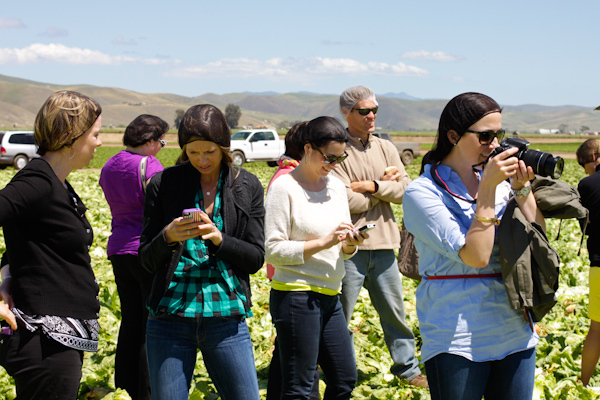 We saw the field operation at one farm in Salinas as they were harvesting iceberg lettuce. 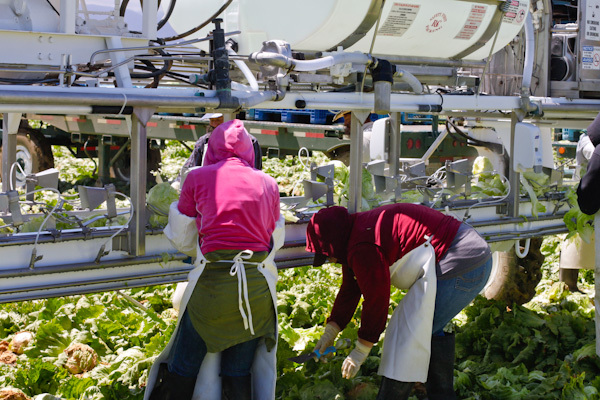 The lettuce is handled only one time, when each worker hand cuts and cores it. It gets washed in the field to remove the natural latex that oozes out, which otherwise would mar the leaves. It gets washed two more times at the plant. All three washes use chlorinated water at a higher level of chlorination than tap water. Lettuce is washed immediately after cutting, and not handled again. I talked with Samantha Cabaluna at Earthbound Farm organics and this is industry standard practice: all bagged salad, organic or not, is washed with chlorinated water. And if you wash your home-grown lettuce with tap water, so is yours. Samantha said they are working on alternatives to using chlorinated water, like citrus-based sanitizers and high-powered ultrasound. For each of their washes at Earthbound Farm, the chlorine level is reduced. This is necessary from a food safety perspective: the chlorine kills bacteria like salmonella and e. coli. You might choose to wash bagged salads—from any company—at home before eating them. If you do, make sure that you have sanitized your sink first, and use filtered water if you want to avoid chlorine entirely. How aware are you about gluten-free diets and vegan diets? Are you working to create salads with ingredients that are packaged separately so people can choose which items to include? This was not especially on their radar, and I was happy to be able to talk with Gil Oetzel—Director of New Product Development—about their salad mixes and ingredients. I suggested that most of their salad dressings were naturally gluten-free, and that this was a selling point they weren’t capitalizing on. I also suggested that they provide at least a few salad kits with vegan dressing, as it seemed ironic that vegans couldn’t eat the entire kit (many have whey, parmesan cheese, or other animal-derived ingredients in them). Last, after finding out they use genetically-modified soybean oil in all their dressings, I suggested they switch to a non-GMO oil. I was encouraged by their openness during the conversation. These gentlemen are crew supervisors; each has worked for Dole for at least ten years, if not decades. Do you use migrant workers for harvesting? While the three crew members I talked to spoke very little English, I was impressed to learn that many of them have worked for Dole for decades, and all are legal. I saw the portable lavatories and hand-washing facilities and felt that the conditions are as good as it gets for manual farm labor (meaning, in a million years I would not physically be able to do it, and I am so appreciative of those who do and feed all of us). The next time you open a bag of lettuce, send a little thanks to the people who harvested it. How do you respond to criticism about the amount of packaging with these “fresh” foods? We use as much post-consumer recycled plastic as we possibly can in the packaging. Actually, many of our grocery store clients want more packaging, not less, to lessen spoilage. All of our packaging films and clamshells are designed to keep the food as fresh as possible, and they all breathe at different rates, depending on the type of produce inside. Our salad kits use a different film for each item, so that everything stays as fresh as possible and the consumer doesn’t have produce that goes bad. Because our produce is shipped all over the country, we don’t have any other option than to package it the way we do. A couple of notes here… I believed their answers and didn’t think they were greenwashing. They were up front about the challenges they have and the solutions they’ve come up with to date, and I believe they’re always looking for better packaging. Given that many, many people don’t have access to fresh salads, I do think these products are your best option to get enough fruits and veggies. I had no idea that the different packages breathe at different rates, or how much technology goes into packaging. It didn’t occur to me that these live foods all breathe; understanding each individual vegetable’s respiration rate helps keep them as fresh as possible. Freshness tips: Gently squeeze the bag in the store to make sure the seal is intact. If any air escapes, choose another package. Keep the salads in the bag they come in and don’t open them until you are ready to use it. Close it securely after opening. Once you break the seal you let oxygen in, so plan on eating the salad as soon as you can after opening. If the leaves are not already cut, leave them uncut until just before serving. Cuts are wounds, and they start to oxidize. I’d like to thank all the people at Dole and their agency DGWB for the invitation and the experience. Want more details? I’ve also posted about the swank and the swag, our lunch at La Bicyclette, and a recipe for iceberg wedge salad with vegan blue cheese dressing. 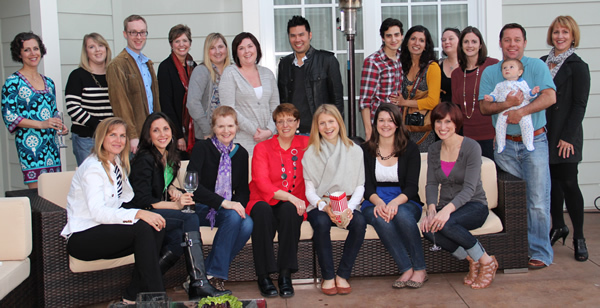 What a nice looking bunch of bloggers! The Renovator is front and center, purple scarf. Here’s a list of all the bloggers in attendance, please do check out their blogs! While Dole paid for my travel and accommodations, I was not paid to attend nor was I asked to post about the experience. I deal with that little ethical dilemma in this post. I bought a bag of Dole Butter Bliss tody with a lable “Enjoy By 7-22-13. There was so much water inside the bag that I had to throw away about a third of the salad — so much of it was covered with black spots. I put piecrs of paper towels in what I did not use for dinner, hoping the remaining would keep for another day or two. Could you please try to have less moisture in future bags. I am not asking for a refund, just hoping there will be less moisture in future bags I buy. Hi Dorothy, I sent you an email about this but wanted to remind readers that any issue they have with a product I mention or review should go directly to the company, not here. I will say, though, that it sounds like something failed in the manufacturing process, as the lettuce is spun dry before bagging. So do let them know. I would be surprised if they did not offer you a coupon for a replacement bag. You can also take something like that back to the grocery store for a refund as well. Thanks for reading! Thoughtful recap, Stephanie. Thanks for the excellent research! You really demonstrate the value of talking to the source of your food and learning how they do things. I thought your post (and Tim’s) was insanely informative as well, which is why I referenced it. I appreciate you guys so much! What a thorough post Stephanie! Great job on this! Really loved meeting you in Monterey and look forward to the next time our paths cross. Thanks Dana, loved meeting you too! See you in Seattle I hope! Thank you for asking these questions, I really appreciate it. You are right, we can’t all get fresh greens locally and this is our alternative. Yes, I think the hairnet was particularly fetching on me, as you’ll see in a future post. 🙂 Anne, you are so welcome. I really tried to think about how I could make the experience relevant for readers like you. I had no idea that organic greens were washed in chlorinated water, and I certainly don’t use precious filtered water to rinse veggies at home. So it was eye opening for me, too. Thanks Ricki. I did a little follow-up research to make sure I had all the facts correct.